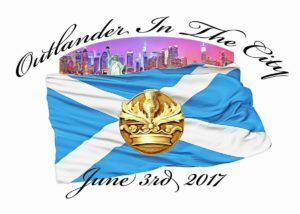 On Saturday June 3, 2017 a little over 250 Outlander fans from around the world turned up in Manhattan for ‘Outlander’ In the City. This charity dinner event held at Papillion Bistro & Bar was designed to be “an evening of mingling with the actors from the STARZ television series Outlander” hosted by Dorianne Panich of Outlander Homepage, Liz Mercado of Liz Mercado Associates, Bonnie Terbush of The Peak Posse, and assistance from many others making it the successful event it turned out to be. Guests were treated to whisky tastings from ambassadors of Laphroaig and Balvenie, Outlander inspired drink specials, and comedian Bruce Devlin who was the emcee for the evening. But the main draw of the evening were the eight Outlander cast members in attendance. Stephen Walters (Angus Mhor), Duncan LaCroix (Murtagh Fraser), Steven Cree (Ian Murray), Gary Lewis (Colum MacKenzie), Grant O’Rourke (Rupert MacKenzie), Nell Hudson ( Laoghaire MacKenzie), Richard Rankin (Roger Wakefield MaKenzie), and surprise guest Wil Johnson (Dr. Joe Abernathy). Each of the scheduled actors were an assignee for a chosen charity and proceeds of the evening as well as money from sales of raffle tickets were evenly divided between the chosen charities: World Child Cancer, International Animal Rescue, Glasgow Children’s Hospital, Save the Children, and We Are Macmillan Cancer Support. (At the time of writing this totals were close to $15,000) Over the next few days I will be posting about each actor and their chosen charity, as well as providing the information for each charity if you would also like to extend support, there may even be a video or two. This entry was posted in Actors, Duncan Lacroix, Editorial, Events, Gary Lewis, Grant O'Rourke, Nell Hudson, Richard Rankin, Stephen Walters, Steven Cree, Wil Johnson and tagged Gary Lewis, Grant O Rourke, Nell Hudson, Outlander, Richard Rankin, Starz, Stephen Walters, Steven Cree, Wil Johnson by Ashley Fendt. Bookmark the permalink.